Posted January 25th, 2018 & filed under 2018, News . NASA’s Global-scale Observations of the Limb and Disk (GOLD) instrument, designed and built by LASP, launched today from Kourou, French Guiana aboard SES-14, a commercial communications satellite built by Airbus Defence and Space. GOLD will investigate the dynamic intermingling of space and Earth’s uppermost atmosphere—and is the first NASA science mission to fly an instrument as a commercially hosted payload. Space is not completely empty: It’s teeming with fast-moving charged particles and electric and magnetic fields that guide their motion. At the boundary between Earth’s atmosphere and space, the charged particles— called the ionosphere—co-exist with the upper reaches of the neutral atmosphere, called the thermosphere. The two commingle and influence one another constantly. This interplay—and the role terrestrial weather, space weather and Earth’s own magnetic field each have in it—is the focus of GOLD’s mission. Posted December 14th, 2017 & filed under 2017, News . NASA’s Global-scale Observations of the Limb and Disk, or GOLD, instrument has successfully completed environmental testing at Airbus in Toulouse, France, in preparation for its groundbreaking mission to observe the nearest reaches of space. Scheduled for launch in late January 2018, GOLD will measure densities and temperatures in Earth’s thermosphere and ionosphere. GOLD is a NASA Mission of Opportunity that will fly an ultraviolet imaging spectrograph on the SES-14 geostationary commercial communications satellite, built by Airbus for SES. The two-channel imaging spectrograph—designed and built at LASP—will explore the boundary between Earth and space, a dynamic area of near-Earth space that responds both to space weather from above and to weather in the atmosphere from below. Posted May 17th, 2017 & filed under 2017, News . 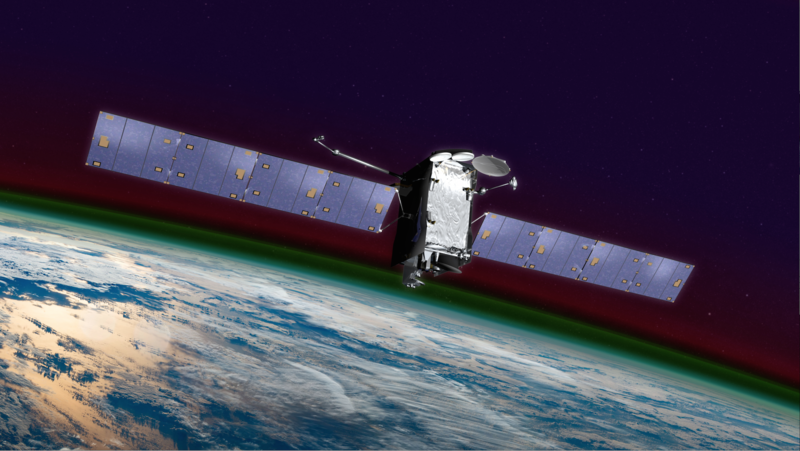 A LASP-built instrument that will provide unprecedented imaging of the Earth’s upper atmosphere has been successfully installed on the commercial satellite that will carry it into geostationary orbit some 22,000 miles above the Earth. The Global-scale Observations of the Limb and Disk (GOLD) mission, led by the University of Central Florida (UCF) and built and operated by LASP, features a collaboration with satellite owner-operator SES Government Solutions (SES GS) to place an ultraviolet instrument as a hosted payload on a commercial satellite. Posted February 1st, 2017 & filed under 2017, News . A NASA instrument that will study the upper atmosphere and the impact of space weather on Earth is a step closer on its journey into space. The Global-scale Observations of the Limb and Disk (GOLD) mission, led by University of Central Florida (UCF) scientist Richard Eastes, is scheduled to launch in late 2017 from Florida. Earlier this month, the LASP-built instrument was shipped to Airbus Defence and Space in Toulouse, France, for integration on the SES-14 communications satellite, on which it will be launched into space. Posted March 31st, 2015 & filed under 2015, News . The Global-scale Observations of the Limb and Disk (GOLD) mission, part of the NASA Explorers Program, passed a rigorous examination on March 5th at the Goddard Space Flight Center in Maryland, enabling the mission to move into the final design and fabrication phase.